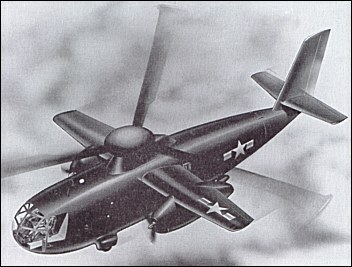 Design of the Model 78 was started in 1950 in answer to a request for proposals for an assault transport helicopter which had been issued by the Navy Department on behalf of the US Marine Corps. Intended to operate from CVE-105 class (USS Commencement Bay) carriers, the new helicopter was to fit on 13.41m by 12.80m deck elevators. Its primary mission was to carry 30 troops to objectives up to 100 naut miles away and return to the carrier without the need to refuel ashore. To fulfil what were then most demanding requirements, McDonnell designed a compound helicopter with a three-bladed rotor and short wings on which were mounted two 3507shp Allison XT56-A-4 turbines. For vertical flight, air from engine-driven auxiliary compressors was to be ducted to 726kg thrust McDonnell 12JP20 pressure jets, one at the extremity of each rotor. For forward flight, each engine was to drive a three-bladed propeller, with transition from helicopter flight mode to conventional flight being made by transferring power from the auxiliary compressors to the propellers as soon as the forward speed exceeded the stalled speed of the wing. Normal accommodation was to have been provided for a crew of two and 30 fully-equipped troops. Alternatively, accommodation could have been provided for 36 troops or 24 litter patients, or two Jeep-sized vehicles could have been carried internally. Larger loads (up to a maximum weight of 5224kg) could be carried externally. 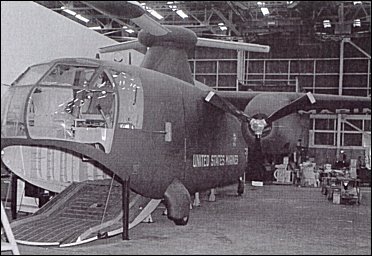 Another noteworthy design feature was the inclusion of a hydraulically-operated loading ramp in the forward fuselage, beneath the cockpit. Folding wings, rotor blades, and tail unit were to have enabled the Model 78 to fit on the deck elevators of CVE-105 carriers. The Navy selected the McDonnell design on 15 March, 1951, and two and a half months later issued a Letter of Intent for three XHRH-1 prototypes (BuNos 133736/133738) to be built under Contract N0a(s)-51-1201. A full-scale mock-up of the XHRH-1 was inspected on 22 and 23 October, 1952, and construction of the prototypes was begun. However, after the Korean War had ended, budget cuts and concern over anticipated developmental problems led to the cancellation of the contract before completion of a single XHRH-1. All work on the project ended in April 1954. All work on the project ended in April 1954.